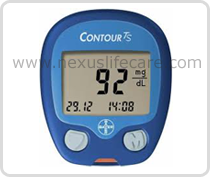 Product Description:- Bayer's CONTOUR® PLUS meter is designed with No Coding™ technology, to automatically code itself every time you insert a test strip. It offers Second Chance sampling i.e. the meter alerts you when a test strip is under-filled and allows you to add more blood within a certain timeframe. Your test strip is designed to easily "sip" the blood into the sample tip. Bayer's CONTOUR® TS system is a simple win for people looking for high performance in blood glucose monitoring. The CONTOUR® TS is the perfect balance of advanced technology and simplicity for easy accuracy in test results. Bayer's CONTOUR® TSmeter is designed to make testing simple and trouble-free, so you can test your blood glucose with ease and gain better control of your diabetes.